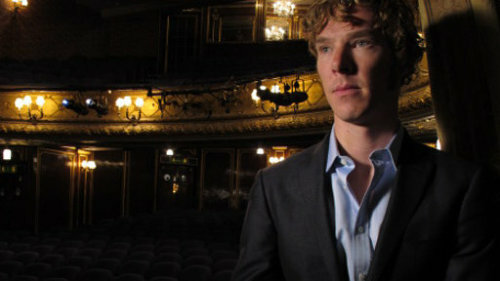 It shall be interesting to see Benedict Cumberbatch on BBC Four tonight. Having burst into the public’s consciousness with his excellent performance as Sherlock, he appears to be angling to become a TV personality of some repute. After an excellent stab at presenting Have I Got News For You last year, he now takes a look at the life and work of Terrence Rattigan, the playwright whose centenary is being celebrated this year. I was unable to see his recent production of Frankenstein at the National, but did get to see a Q&A with the stars and director. Cumberbatch was intelligent and immensely charming. With qualities like that, it is clear that he could do very well as a presenter with mainstream clout doing high-brow documentaries. The important thing tonight, though, is how insightful the documentary will be, more than how engaging Cumberbatch undoubtedly will be. Indeed, documentaries fronted by the famous often have that problem of lacking expertise. For instance, like Stephen Fry though I do, some of his documentary output has been somewhat disappointing. His series in America, for example, was bland. Hopefully, Cumberbatch can do better. It should also be remembered, that Cumberbatch is still one of Britain’s most exciting young actors. A second series of Sherlock is on the way; he has a role in the film adaptation of Tinker, Tailor, Soldier, Spy; he has worked with Steven Spielberg in War Horse. The 35 year-old is hitting his prime and could be a great entertainer for years to come.